If you're lifting heavy and working out hard, you may be looking for ways to up your calorie intake to help build more mass. Weight-gain products such as Weight Gainer 1850 may help provide the calories you need. This high-calorie supplement may not be appropriate for everyone, however. Consult your doctor before adding a weight-gain supplement to your daily routine. Weight Gainer 1850 is a very-high-calorie supplement made by GNC. According to the makers, the product is specifically designed to help you put on the pounds. Although anyone can use the weight-gain supplement, it's marketed toward people following a fitness or workout program. One serving of Weight Gainer 1850, when mixed with 2 percent milk, contains 1,850 calories, 354 grams of carbs, 74 grams of protein and 17 grams of fat. The supplement is also fortified with vitamins and minerals, including vitamins A, C and D, the B vitamins, zinc, magnesium and chromium. As a high-calorie supplement, the drink makes a convenient choice for those trying to gain weight. The McKinley Health Center reports that every 500 calories you consume per day above your normal needs will produce a gain of 1 pound over one week. So the GNC product would help you gain almost 4 pounds in a week if you consume it in addition to your usual daily intake. Weight-gain results may vary based on your genetics and activity, however. If you're using Weight Gainer 1850 as a supplement for your workouts, you might consider drinking it as your post-workout meal. Muscle building is at its peak in the 30 minutes after a workout, and it's recommended that you consume a meal containing protein, fat and carbs within that window of time to promote muscle growth and replenish muscle glycogen stores. If you're having trouble meeting your high-calorie needs with food, Weight Gainer 1850 may help. As a very-high-calorie supplement, however, it might tip your calories in the wrong direction if you're getting more than you need. Getting too many calories from any source can lead to unwanted fat gain. 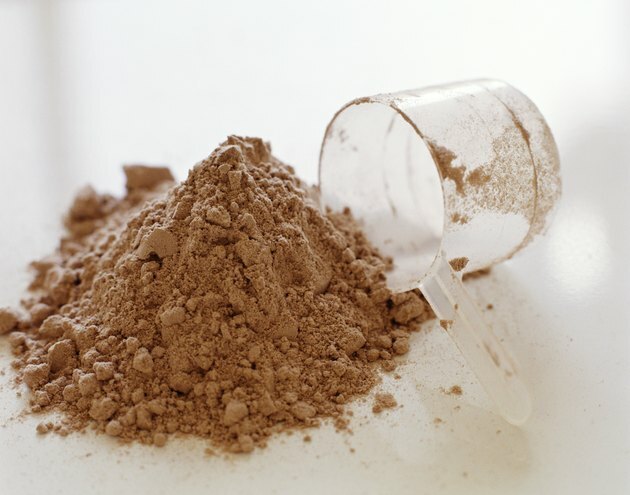 In addition to being high in calories, the weight-gain supplement is also high in protein. An excessive protein intake may lead to elevated amino acid and ammonia levels, according to a 2006 report published in the International Journal of Sport Nutrition and Exercise Metabolism. The review describes the possibility that too much protein -- when it makes up more than 35 percent of your total calorie intake -- may overload the body's capacity to break it down and lead to severe symptoms, or even death. To prevent excessive protein intake, you want to count the protein from the supplement, in addition to the protein from other sources in your diet such as meat, dairy foods and other supplements, to stay in balance. For most people, the recommended 3 cups of Weight Gainer 1850 mixed with 24 ounces of milk may be too high in calories to promote healthy weight gain, but you may be able to use the supplement in smaller amounts to help you get the calories you need. For example, use only one third of the recommended serving -- 1 cup mixed with 8 ounces of 2 percent milk -- to create a 616-calorie and 25-gram protein drink. Mixing the cup of powder with water instead of milk means your drink will contain 120 fewer calories and 8 fewer grams of protein.